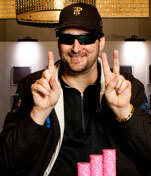 I recently played in Day 1 of the Ultimatebet.com Aruba Poker Classic. After working out on Monday night, and meditating right before I played, I felt ready to finally make it through Day 1. During the last three years, I didn’t make it past the first day. At least one of those years I just played badly. Three years ago, I self-destructed and knocked myself out of the tournament early. Two years ago, I lost a hand where the flop was K-7-7, and my opponent called a check raise with Q-Q, only to hit a queen on the turn and bust me. Last year I had some bad luck along with some average play. This year I felt like I was at or near the peak of my powers, and thus I trusted myself when I decided to avoid slow playing any of my hands. The reason that I decided against using the slow-play tactic was this: it is too risky for one tournament result. At the World Series of Poker I can use the slow-play tactic, and if it doesn’t work, then I get to play the very next day. Here in Aruba, if the slow-play tactic didn’t work, then I would have to go to Plan B, and hang out at the beach. Plan B wasn’t bad (it is Aruba! ), but I’m trying to be a champion every time I play a tournament. The problem with slow playing your hands is that all too often you lose the pot by either getting drawn out, or you confuse your opponent into overplaying his hand. For example, say that Player A opens for $400, I call with 10-10, and Player B then reraises it with A-J or 8-8. Now Player A folds, and you find yourself in an awkward position because you don’t know where you stand. Now what do you do? It’s hard to raise it a third time with just 10-10, so you call, but your opponent doesn’t know what you have, and thus doesn’t know that he’s bluffing you when the flop is J-3-2 (and he has 8-8). If you play this hand straight up, then you “define it.” By defining your hand, the regular rules of a hand apply, and at least your opponent will know when he’s bluffing you (or trying to), which allows you the chance to make a good read and pick off his bluff. After committing myself to avoid slow-play tactics, I found myself slow playing four hands, all of which I ended up losing. To make matters worse, I was pretty sure that I would have won at least three of them had I played them straight up. After getting low on chips, and berating myself, I gave up the slow-play tactics altogether and I ran my chips up to about $15,000. Poker is easier to play when you play it straight up! With an hour left on Day 1 and the blinds at $150-$300 — and antes $25 a man — I opened for $950 with K-J off suit. Player A, who had reminded me that he was at my table two years ago when I took a bad beat to a queen on the turn, made it $2,000 to go. Now, I had played two other hands against Player A, and both times he had pocket aces. I was sure that he didn’t have aces or kings, because he had a different look. In fact, I thought that Player A had 9-9 or Q-Q, or somewhere in between. The raise was only another $1,050, so I called. The flop was Jc-Js-10c, and Player A bet out $2,000. Within three seconds I stood up and moved all-in, pushing all of my chips into the pot. This group of players knew that it was only the second time that I had moved all-in all day long. It would cost Player A his last $7,900 to call. I whispered to a friend that was watching that Player A had pocket queens. Then I sat back down to sell the hand a little bit. I looked to my right, avoiding eye contact with Player A whilst doing my best to sell the story that I was indeed weak.